A surfer who survived more than 30 hours adrift in the Irish Sea has hailed his rescuers as heroes, while his father said the phone call saying he had been found alive "was better than a lottery win". Matthew Bryce, 22, was reported missing by family when he failed to return from a Sunday morning surf off the Argyll coast of Scotland. The 22-year-old was eventually found by a search and rescue helicopter at around 7.30pm yesterday, drifting in the North Channel, about halfway between Northern Ireland and Scotland. The Glaswegian was flown to Belfast, where he is currently recovering from hypothermia. "I am so grateful that I am now receiving treatment in hospital," said Mr Bryce. "I cannot thank those enough who rescued and cared for me, they are all heroes." The surfer had last been seen at around 9am on Sunday in the St Catherines area of Argyll, believed to be heading to Westport Beach near Campbeltown. John Bryce, Matthew's father, also expressed his gratitude. "The past 48 hours have been an absolute rollercoaster of emotions for our family and we are so grateful that Matthew has been found safe and well," he said. "To get that call from the police last night to say that he was alive was unbelievable. It was better than a lottery win - you just can't describe it. "Matthew means the world to us; he is such a strong character both mentally and physically, and we are looking forward to being reunited with him. "We've managed to speak to him briefly on the phone and he is obviously exhausted after his ordeal, but he is in good spirits and happy to be alive. "Our family cannot thank the Coastguard, RNLI volunteers and police officers involved in finding Matthew enough. "I would also like to thank our friends and family as well as the hundreds of people who offered their support on social media. "We have been overwhelmed by your support and good wishes and we will be forever grateful to every single one of you." The Coastguard believe Mr Bryce's surfing knowledge and wetsuit saved his life. Conditions in the area were also "fairly benign" throughout yesterday. A surfer who survived more than 30 hours stranded at sea on his board has been described as "extremely lucky". Matthew Bryce, 22, was reported missing by family when he failed to return from a surfing trip off the Argyll coast of Scotland on Sunday afternoon. He had last been seen at around 9am on Sunday in the St Catherine's area, believed to be heading to Westport Beach near Campbeltown. Police Scotland and the coastguard launched a large-scale search, with a number of rescue teams involved. 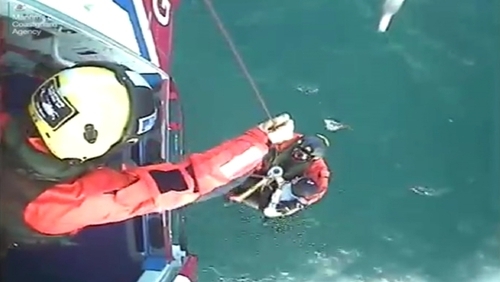 Dawn Petrie, from the Belfast coastguard operations centre, said: "He'd been in the water for some 30 hours when the helicopter was delighted to spot him." Speaking on RTÉ's Morning Ireland, Ms Petrie said Mr Bryce was suffering from hypothermia but was conscious when he was taken from the water. She said it was unusual for someone to survive so long at sea, describing it as the "top end of survivability." "He was a very fit gentleman, which increases his survivability," she said. "He also did the right thing by staying with the surfboard, so that gave him buoyancy. It also meant that he wasn't physically in the water as much as he would be if he'd just been a swimmer. "He was also wearing the correct equipment - he had a very thick neoprene wetsuit which aided in keeping his body temperature up enough to increase his survivability," she added. Police thanked everyone who had been involved in the search. Chief Inspector Paul Robertson said: "The response to our appeal to find Matthew has been outstanding. "It has been a real team effort and I would like to thank everyone who offered their assistance." Alex Smith, from the coastguard, told BBC Radio Scotland: "His core body temperature was certainly very low but he is a very fit young man. "It would've been quicker for us to find him if he had a personal locator beacon, a flare pack or a radio. "I understand you don't want to be encumbered by too much equipment on a surfboard but even just having a shore contact who will raise the alarm if you fail to turn up. "This gentleman was already 24 hours late when the alarm was raised."